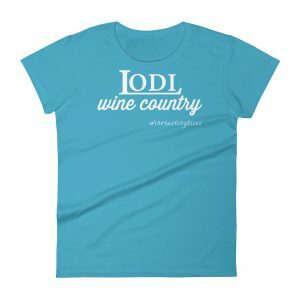 Discovering a hidden gem of a winery brings us boundless joy! 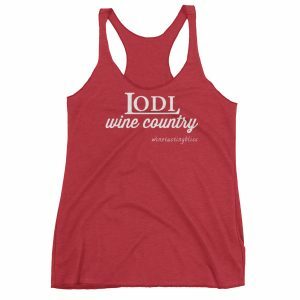 A recent wine tasting trip to Lodi gave us several opportunities to experience new wineries. One of the most hidden among them turned out to be an amazing experience. 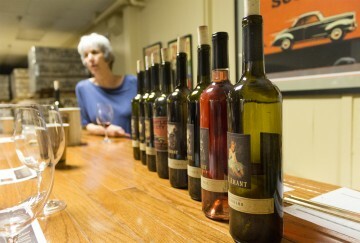 We are definitely adding St. Amant Winery to our “can’t miss” list! 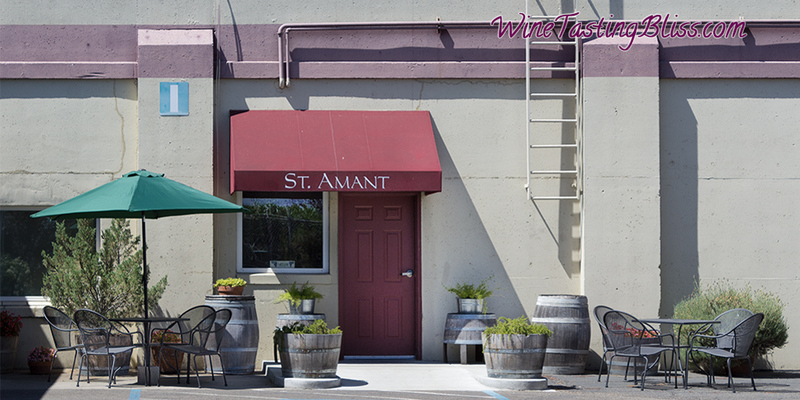 After a rollicking time at Klinker Brick Winery, we decided to explore another new (to us) winery: St. Amant. At first, we were certain that we had taken a wrong turn, because we found ourselves facing a guard shack in front of a massive, concrete factory. The guard shack was untended, so we cautiously crept ahead and drove past sizable loading docks and found the welcome sight of the awning of St. Amant. We parked in an ample lot and made our way through their entry, to discover a winery bursting with wine, vines and celebration of their craft. There was no wasted space anywhere! Every bit of the interior demonstrated a true love for making wine, so we knew that we had found something special. 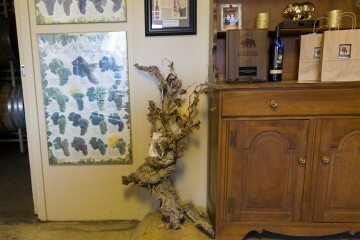 The space was divided into areas devoted to wine storage, wine tasting, and wine celebration. We took our places at the tasting bar and met Barbara (who turned out to be the owner) and wine guide Nathan, who got us started with our tasting flight. Given the size of the tasting menu, we went with our tried-and-true divide and conquer strategy to be sure that we give everything a fair shake. 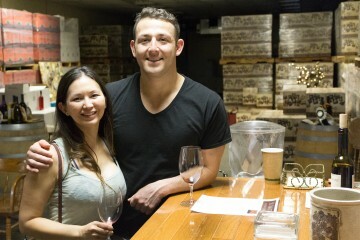 The St. Amant wines were spectacular! Some of our favorites included the 2016 Verdelho (their first year of production, using whole cluster pressing) was a great starter, with fun mango, grapefruit and apricot notes. The 2016 Barbera Rosé was delicious and creamy, without the tart element that can come in a Barbera Rosé. Another hit was their 2015 Marian’s Zinfandel, a gentle Zin with so many layers and a surprisingly long finish. 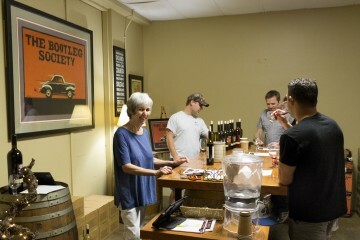 The 2014 Speakeasy Red, bottled under their “Bootleg Society” label, was our “best of tasting” with fruit up front, soft pepper and a zooming coffee finish. This blend of Zin, Barbera, Tempranillo, and “a few secret ingredients” was much too nice not to take home. St. Amant makes two more fans! 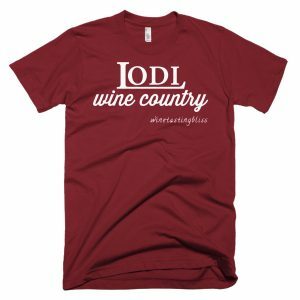 The 2014 Lloyd Martel Cabernet was extremely smooth, with cherry notes dancing about. Someone said, “This will get you in trouble, because it is everything a Cab should be.” Their 2015 Tempranillo was described as their new flagship wine. Made from late-ripening grapes, we noticed somewhat more tannins hiding behind delightful fruit notes. We finished with their 2014 Bootleg Port, a nice ruby-style Port that could only be nicer if it wasn’t sold out. Once again, we agonized over our wine purchases before saying goodbye to Barbara and Nathan. We had one more tasting ahead of us. Wonder where we will end up? Have you visited St. Amant? Click to give'em a tweet of support!